The cTrader QuickFx trading terminal allows you to execute fast trades while at the same time easily switch between tabs to manage them. You can also create complete order types using such features as swing high, low, last bar high, low and even preview the order before you submit. "What the Customers are Saying"
Without doubt the best ordering terminal I have come across on the market, due to the simplistic nature and speed of the terminal my daytrading has become alot more profitable due to the easy of ordering as well as closing positions. The advanced features make it alot easier to place orders with specific criteria based on the chosen timeframe the user selects. I would highly recommend this to all traders regardless of experience but would recommend to beginners especially as this tool can stop the small mistakes that can make a good strategy/trader look bad and can seriously enhance the bottom line of your trading profits. The quick tab is perfect for fast execution of trades where you have all the information you need to execute your trades. The terminal has many useful features that will not be obvious at first glance, this section should help you understand how it will help your trading. The Depth of Market (DOM) may not work with some brokers, please check on the cTrader platform first to make sure you have this feature. It is very important to see all your open positions at a glance, especially if you are not a full-time trader and have other work to do. 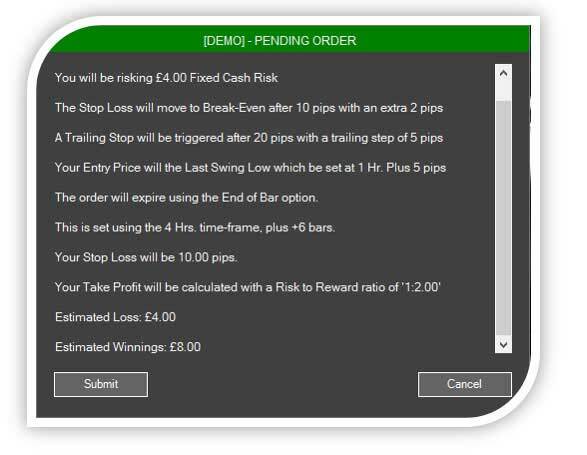 The positions screen can manage all your trades very easily as well as minimise to a widget view. The terminal provides protection in the form of a break-even with extra pips and a trailing stop which trails behind the current price by a number of pips you set. You can apply the protection to a Market or Pending Order. When you create a Market or Pending order you can set the protection before the order is submitted. You can have both Break-even and trailing stop set at same time. Typical Example would be a position breaks even after 10 pips with an extra 2 pips to cover set-up costs, then when the position is 20 pips in profit it will trail 5 pips behind the current symbol price and will continue to trail until the price reverses 5 pips and hits the stop loss leaving you in profit. Trading with voice alerts can be very useful when you are multitasking, sometimes having a friendly voice telling you a pending limit order has just been filled can be very useful. 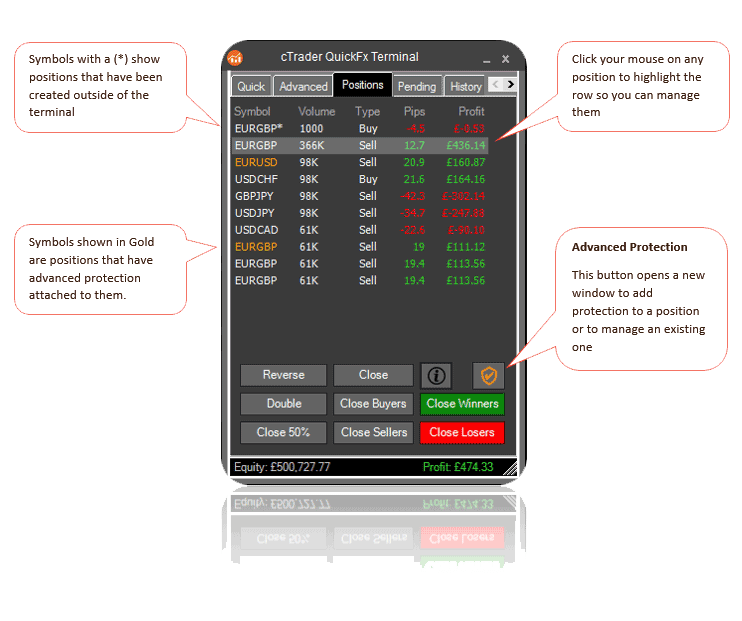 The cTrader QuickFx terminal uses voice alerts in all trade activity, this can also be turned on or off. Adding the advanced protection to a pending order is the same process as for an open position, you just select the order and click on the protection button, you can read more about how to manage pending orders I the next section. 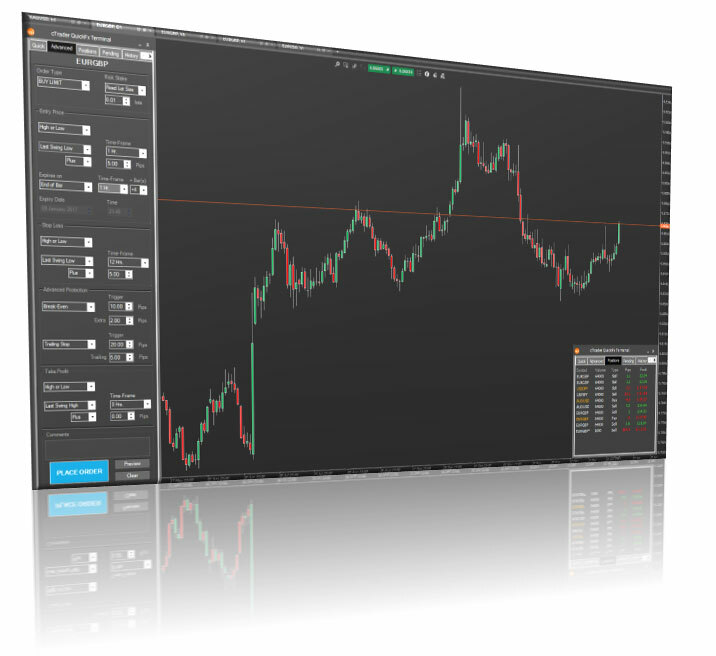 The QuickFx terminal allows multiple windows open at the same time while using very little of your computer’s precious memory, this can be helpful when you are trading many currency pairs at the same time or wish to maximise chart space while managing open trades. The advanced tab allows you to create complex order types, the screen dynamically changes depending on what you want to do, the next page shows a typical complex Buy Limit order type. The colour of the confirmation caption is red or green depending if it is Buy or Sell. You are shown what your estimated Loss and Winnings are so that you are sure of the order before you submit it. Market order confirmations are simple, but the advanced order confirmations are much more detailed. A voice will also tell you a market order has been filled correctly, this too can be turned off, please read the section about the voice pack. 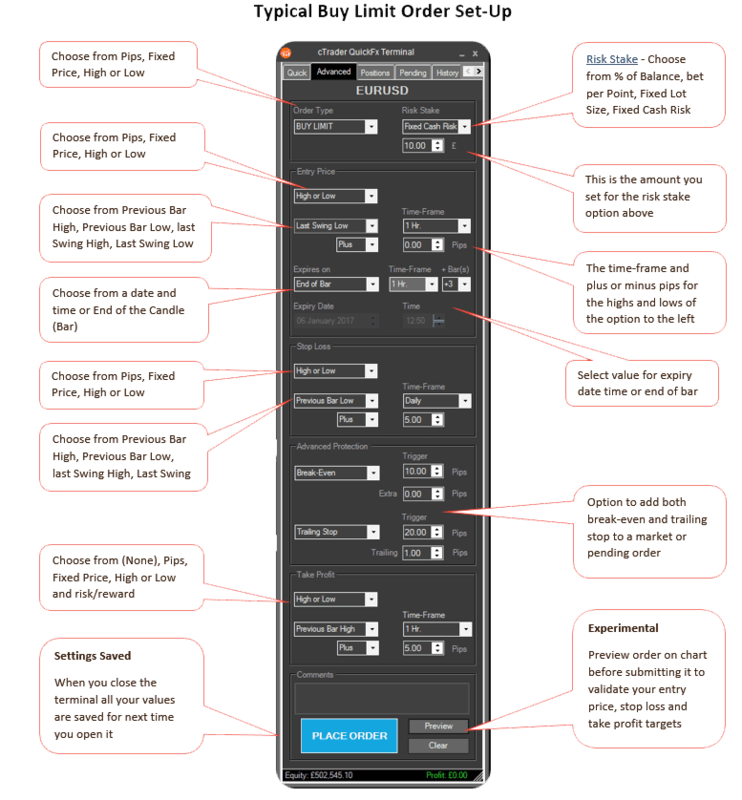 This section explains in more detail the options that you have in the advanced order tab that may not be obvious at first glance. Buy, Sell, Buy Limit, Buy Stop, Sell Limit and Sell Stop are all standard order types, you can read more about these types of orders by visiting Investopedia which is a very good source of information. There are 4 different types of risk stakes per trade. % of balance – It allows the ability to specify the % of your account you wish to allocate to a trade and then cTrader automatically gives you the relevant lot size/volume, this also takes into account your stop loss. Entry Price, Stop Loss & Take Profit Options - All of the above have the same settings, the take profit has some extra options that are explained below. this is only for taking profit and allows you to specify a multiplier of profit from a loss, so if you stop loss was 10 pips and you set the multiple 2.00, it will be 1:2, so twice the profit. You also have the option to use decimal values, so if you set the multiple to 2.5, you will get 1:2.5, so 2 ½ times the loss as profit and with a 10 pip stop loss it would be 25 pips profit. As standard, you can set the expiry date and time, but we have added some extra logic to allow you to set the expiry of an order at the end of a set number of bars (candles) together with a custom time-frame. In the image below, this would expire the order after 4 hours, which is 4 bars at 1 hr. each, you can set any time-frame and up to 10 bars including current. You may want to set your entry price, stop loss or take profit above or below the previous bars highest or lowest price. An example would be to set the time-frame to Daily and the take profit to the previous days highest value plus some extra pips for a buffer. Last swing high – A swing high is formed when the high of a price is greater than a given number of highs positioned around it. 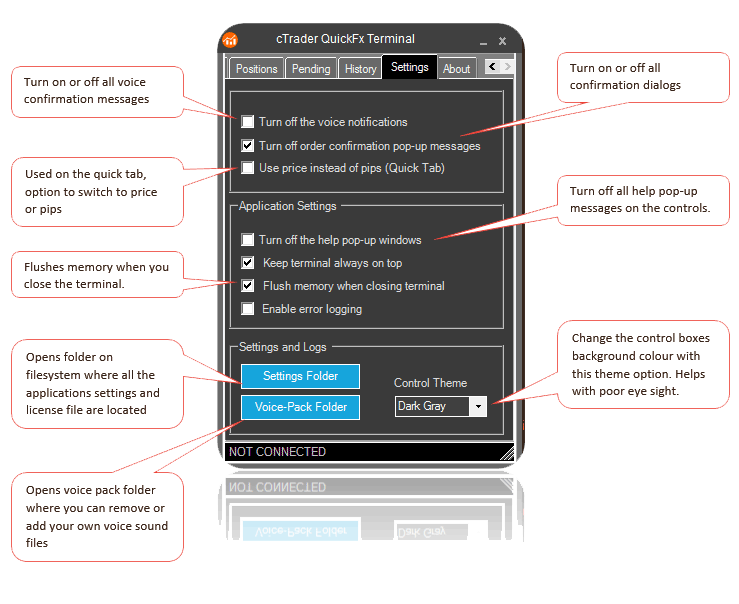 We have given you some control over the terminal so that you can turn on or off features you do not like, for example when you run the application for the first time you have help pop-ups on all controls explaining how to use them, this can irritate some people. If you are a very cautious trader and want to make sure your settings for the trade are correct before you pull the trigger, then you would want this turned on. If on the other hand you are a scalper or want fast decisions when you enter a trade you would not want this feature to delay the execution. If you find the voice notifications irritating, you can turn all of them completely off by deselecting the checkbox. Without doubt the best ordering terminal I have come across on the market, due to the simplistic nature and speed of the terminal my daytrading has become alot more profitable due to the easy of ordering as well as closing positions. The advanced features make it alot easier to place orders with specific criteria based on the chosen timeframe the user selects. This product is under valued at the current price. It offers so much for so little and is a fantastic bolt on product that takes cTrader to new levels. Excellent! 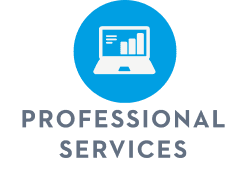 QuickFX is a great cBot and makes managing positions streamlined and efficient and thus opens up the my potentials for greater profits. Myriad options to both manage and protect my trades, including knocking out winners and losers with one click, which is obviously pivotally important when things go south while one trades a plethora of positions. This was a great investment and I need to commend Paul for coding such a sweet piece off add-on. Good on you, Paul. Keep up the good work.